Oman is an exotic and mysterious land with some of the most unspoilt landscapes in the world. Arabian nights and Sinbad are what still comes to mind to this day. 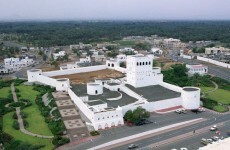 Oman holidays are fascinating for culture, history, and luxury retreats. Direct Traveller offers quality Oman tours, Muscat city breaks and beach holidays. Go wild Dolphin watching in Musandam, take in the culture by shopping in the infamous Souks in old Muscat city. Be adventurous and cross the desert in a 4x4, smell the exotic Frankincense scent of Oman, indulge in food that is cooked traditionally in underground clay ovens, visit the lost city of Ubar, visit the ancient fort of Nizwa. There is so much to do in Oman, all with the pleasant touch of traditionalism. Oman is a collaboration of unique landscapes, all flowing together to create a beautifully textured aspect of Arabia. Picture dunes dusted with sun and shifting shadows, a capital city set aglow amid dancing bulbs of ambient light and a coastline of untouched sand and rugged mountainous distance. Everywhere you turn is a host to adventurous possibilities and natural enchantment. The warm hearted locals and enthusiasm for art and culture gives Oman a welcoming and exciting presence, one that brings together a mixture of people and desires. 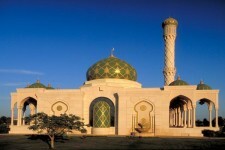 Located to the Southeast of Asia, Oman is one of the most developed Arab countries. It is home to some very sophisticated hotels and establishments, creating a contented way of life. Luxury is not the first impression Oman gives however. Upon stepping into the country you’ll immediately be swallowed up by the feeling that you’ve gone back in time. A foundation of old civilisations and their settlements, some of which date all the way back to the Stone Age, are still left to breathe the air of the present in the comfort of the undisturbed scenery. The nature sparks a charismatic spirit into the environment, one that creates a pulse inspired by the past and calls for new explorers. Opportunities for thrills are in abundance here too, with the chance to go mountain climbing, exploring caves or courageously diving into hidden waters like the Hatta Pools, or just relaxing on Oman beaches. You can venture through the ribbons of exotic wildlife that inhabit the Musandam Peninsula, spotting dolphins and whales, or perhaps take a trip on a camel and go desert camping, spending the night in the tranquillity of complete Arabian wilderness! A diverse range of atmospheric qualities means that Oman holidays can satisfy most moods. If you want to relax, look no further than the 3,165 kilometres of gold tinted coastline. This is host to a whole range of beach environments too. There are the socially thriving sands that share the environment with groups of friends and families, or the many undisturbed coves that are shaped with natural geographical change and provide complete serenity and an exciting location for exploring. Al Bustan Beach in particular is a popular one. It is located in the governorate of Muscat, and with edges hugged by mountains it maintains a sense of privacy and escapism that is a trademark of many Omani beaches. The capital city is a strong personality amongst the space, with its tall spires and domes silhouetted boldly against the sunset, marking a skyline of eastern mystique and beauty. The mixture of the old and the new combine to create an atmosphere that is in a time of its own, unique to anywhere else with its history incorporated into the modern facilities. You can wander around the trendy shops, eat in fancy restaurants and finish the night in lavish, lively bars all the while wandering down narrow streets scattered with traditional houses and historical architecture, stopping in markets selling handcrafts and other souvenirs. Oman is a collaboration of unique landscapes, all flowing together to create a beautifully textured aspect of Arabia. Picture dunes dusted with sun and shifting shadows, a capital city set aglow amid dancing bulbs of ambient light and a coastline of untouched sand and rugged mountainous distance. Everywhere you turn is a host to adventurous possibilities and natural enchantment. The warm hearted locals and enthusiasm for art and culture gives Oman a welcoming and exciting presence, one that brings together a mixture of people and desires. Located to the Southeast of Asia, Oman is one of the most developed Arab countries. It is home to some very sophisticated hotels and establishments, creating a contented way of life. Luxury is not the first impression Oman gives however. Upon stepping into the country you’ll immediately be swallowed up by the feeling that you’ve gone back in time. A foundation of old civilisations and their settlements, some of which date all the way back to the Stone Age, are still left to breathe the air of the present in the comfort of the undisturbed scenery. A diverse range of atmospheric qualities means that Oman can satisfy most moods. If you want to relax, look no further than the 3,165 kilometres of gold tinted coastline. This is host to a whole range of beach environments too. There are the socially thriving sands that share the environment with groups of friends and families, or the many undisturbed coves that are shaped with natural geographical change and provide complete serenity and an exciting location for exploring. Al Bustan Beach in particular is a popular one. It is located in the governorate of Muscat, and with edges hugged by mountains it maintains a sense of privacy and escapism that is a trademark of many Omani beaches.